Greeting once again from Sakai, Japan. We hope that this letter finds you well and enjoying the blessings of our Lord. Well, it is time once again to update you on some of the wonderful things that God is doing at SIBC. The above verse from 1 Peter was the theme of our Easter service last weekend. It was a wonderful day of music and fellowship in celebration of the resurrection of our Lord Jesus. Many first-time visitors and guests joined us as we shared the new birth and living hope that God offers to us through his Son. The service was followed by our annual Easter potluck and Michael even debuted his newly acquired skill for the children: balloon animals! We are truly thankful for the Lord’s blessing on the day’s events. Please now pray with us for all of those non-believers (both Japanese and foreigners) who heard the Gospel message. May they open up their hearts to the One who can give them new life. We had two special events leading up to Easter Sunday. First, in late March we held our annual Children’s Easter Party. This is a time to reach out to children and families who are not a part of the church. Again we had a great turnout (though many had left before we were able to take our group picture) with many new visitors and non-believers. Through songs, games, crafts and an Easter message, we proclaimed to the children (and their parents!) the Good News of the Resurrection. Please pray that God would do a wonderful work in the hearts of the many visitors and that they will want to join us again soon. Our second event was on Palm Sunday. In preparation for the resurrection of Easter, we spent the day focusing on the cross of Jesus Christ. In the morning, we looked at the impact that the cross should have on our lives today. Then, in the afternoon, we watched the “The Passion of the Christ” together. The turnout for the movie was not as good as we had hoped (this day just happened to be the peak day for viewing the cherry blossoms! ), but it was still a good way to be reminded of Christ’s work for us and to prepare our hearts for Easter. The Covenant Players, a traveling drama team that ministers in churches in Japan, Hawaii and Guam, joined us for two days in March. Besides performing at our Easter Party on Saturday, they also shared with us during our Sunday morning worship service. 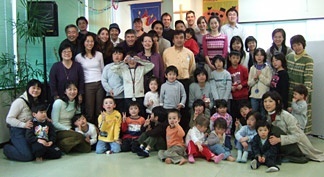 Their ability to do drama in both English and Japanese was perfect for our bilingual church. Although their ministry was a blessing, their testimony was even more powerful. They spend 11 months of the year on the road, always staying in people’s homes or sleeping in churches. Their one free month is then spent staying with family, so they are in fact “homeless.” Yet, some of them have been doing this for over 20 years! Their willingness to give up the comfort and security of a “home” for the sake of the Gospel was a great inspiration to many. Next up on the church calendar is a baptism service on May 28th. 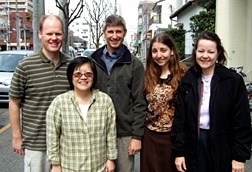 We have two young women who have recently decided to believe in Jesus, Yui and Hisae. We also have 3 boys from our Sunday school who have expressed a desire to be baptized. Their names are Ken, Yuki and Hikaru. Please pray for these five as they take this important step in their walk with Jesus. May the Holy Spirit be working in their hearts so that they would long to be genuine lovers of God and fully devoted followers of Jesus Christ. We are planning to make a quick trip to the States this summer, for a short time of deputation and support raising. We will arrive in late June, just in time to attend JEMS’ Mount Hermon Conference. The entire month of July will then be spent in the Los Angeles area. This will give us 4 or 5 weeks to visit those churches that we were not able to visit in 2004. Finally, we will spend our last two weeks up in the Northwest, before heading back to Japan in mid- August. We would appreciate your prayers for all of the details that still need to be worked out. Finally, here are some things that you can be praying for. As always, we deeply value your prayers for us and for the ministry here. 1) Please pray for those non-believers who attended the Children’s Easter Party and the Easter Service. May the Lord draw them to Himself. 2) Please pray for the baptisms on May 28. Pray especially for Yui, Hisae, Ken, Yuki and Hikaru. 3) Please pray for our time of deputation in the States this summer. Pray especially that the Lord would provide housing and a car for us to use while we are in L.A. for the month of July. Thank you again for your prayers and support. May the Lord bless you for the blessing that you have been to us.